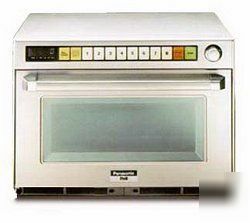 Panasonic's NE-2180 commercial microwave ovens are constructed of durable stainless steel both inside and out, to meet NSF standards. The door hinges alone are tested 400,000 times. The ovens' speed, "quick-pick" programmable pads and reliability satisfy the needs of any commercial kitchen.